Thread: Ask Kristian Karlsson a question! I actually remember playing against your brother Mattias a few years ago in Safir International :P That match was bad playing from me but of course, Mattias was way better Do you still practise a lot with your brother and did you self at some point try pimple-rubbers on one side like Mattias has (at least had). Short pimple on forehand and "normal" rubber on backhand is quite unusual style to play with. Did you also think or try playing with this style at some point? Haha ok first of all, he is actually NOT my brother, we are not even related Karlsson is a really common name in Sweden but people say we kinda look alike aswell. So you're not the first one nor the last one with that assumption . I practice alot with Mattias since we're in the same training group in Sweden (Halmstad)I've never tried playing with Pimples. Take care thanks for the support! Haha don't worry about it ! Your biggest table tenis victory ever? In terms of a tournament victory it's probably when i Won u21 World Tour Korea 2012 or Top 12 in Sweden. Congratulations winning the Swedish National Championships today Kristian! Fantastic work! kristian i just watched your match against gao ning in WTCC 2014, man you so had him and he got lucky!!! !, exceleeent match! BTW that backhand that you have, are you kidding me ? its soooo top class! The best of lucks im sure ill keep watching you doing better and better! Are you going to change your setup anytime soon?If so,to what? What would you recommend for players learning the basics? You have by far the best backhand in the swedish national team, so my question is, do you just have an extra talented backhand or have you been practising it more than for example Jens? Have you tried Stigas new rubber Airoc? If so what is your thoughts about it? 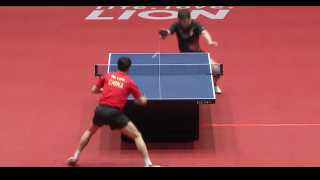 How was it to play against Xu Xin? Just watched the game with samsonov in czech open 2014, and damn your backhand is even better now, vladi didnt know what to do man! Congratz! Do you reccomend Hurricane and Tenergy with Hurricane Long 3 blade for my setup? BEST OF LUCK IN YOUR TOURMENTS! You have showed excellent backhand blocking skills against samsonov...i wish to learn from you more thru the videos. Keep playing and insipre us. Ahh, as a player who also has problems with forehand (though I'm sure that your Forehand was 100000 times better than mine even when you say that it was bad earlier) ,my main problem is that I have developed a bad habit of changing the grip to a more "serve like" grip while going in for the short game because my wrist is more free but it causes serious problems when I have to quickly do a FH topspin as my grip won't be proper at all. Most of my points are lost because of this. I'm trying to change this but it seems so difficult. I'm using very forgiving rubbers (Mark V) so should I change to something stricter like Hurricane. Honestly, my forehand is less than half as skilled as the other aspects of my game and it is costing me dearly. Or do you have any tips that can help me when I am practicing? Last edited by anchorschmidt; 08-30-2014 at 10:04 AM. how your normal training looks like? Last edited by garbol; 08-30-2014 at 12:15 PM. Just saw the video of You vs Samsonov, just wow. Some of those counters were truly amazing. Hope to see you competing in the WTTC in the future! Hi Kristian, I saw your match against Samsonov on youtube yesterday , and let me tell I was amazed by your level of playing.I had never seen you playing before and from now and on you are my favourite european player.I think if you mantain this level you could be on the top 10 very soon , what do you think?